Translation: "There was a proverb in old Tamsui that went "Never marry a girl from Bali", a warning to the prospective groom on the heavy financial burden since expensive wedding cakes would be required to distribute to ALL the bride's fellow villagers (i.e., easily the whole Bali). The founder of SanXieChen Mr Li Shui-ching, realizing a vast potential market, had, through the introduction of NTU Ob-Gyn chairman Dr AuYang Pei-chuan, got to know and learn from the chief chef of the British Consulate Mr Tu Chai-he on how to make a better pie crust than the old soggy ones. And through his son-in-law, Mr Lin Tung-chou who was Commerce Secretary at the Consulate, Mr Li had imported the famed English Bush Boake Allen spices to improve the flavor of the fillings. Combining East and West, the winter melon meat pie became an instant hit which made SanXieChen Bakeries a well-known brand name since that had lasted for the past 70 years." At some point in the 50s, winter melon in the cake was replaced with chocolate. 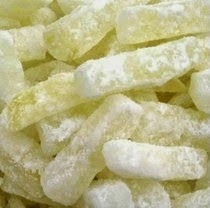 For those who disliked the overly sweet, sugar-cured winter melon bits (left, bite-size chunks), Hallelujah! Too bad it was discontinued after a short while. 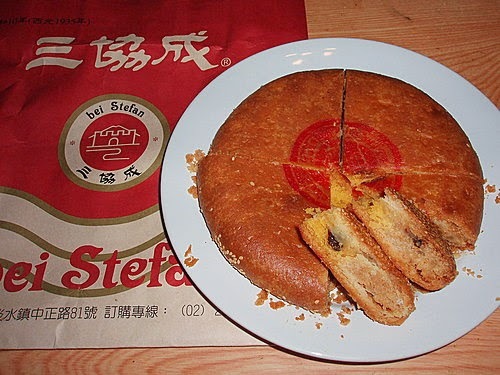 Current owner Mr 李志仁 is too young to remember chocolate meat pie. We'll try to convince him for a revival. Incidentally, Mr Li's aunt was one of the Japanese immigrants who stayed behind in 1946 when everyone else was sent back to Japan. As kids, we were often puzzled by her heavily accented Taiwanese.